Megatron and his Decepticons have destroyed the Autobots’ headquarters, scattering Optimus Prime and his heroic team across the country and leaving them out of communication with one another. Meanwhile, Shockwave has come to the side of his commander, bringing with him the newest Decepticon weapon. Can the Autobots reunite in time to defeat Megatron and the Decepticons once and for all? Or does this new weapon mean the end for the Autobots...and Earth? 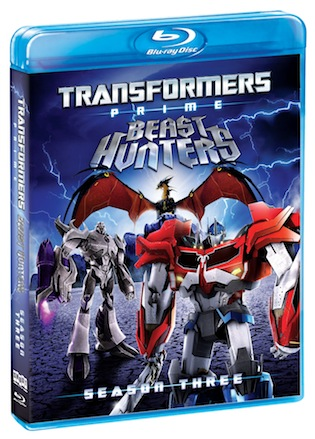 Find out in the final exciting season of the Emmy Award-winning series Transformers Prime Beast Hunters! My daughter loves anything Transformers and she was extremely excited when I brought home the Transformers Prime Beast Hunters season three. She waited for her dad to get home from work because she knew he would be excited to watch it too! My husband also loves Transformers and was thrilled to watch it with her. This season was great and created the perfect opportunity for my daughter and her daddy to spend some quality time together. They played with her transformers figures while watching the episodes. The storylines are interesting and age appropriate! You can now purchase either the two disc blu-ray or DVD since it's out in stores today! Disclosure: All opinions are my own. I received Transformers Prime Season Three at no cost for the purpose of this review. No other compensation was received.